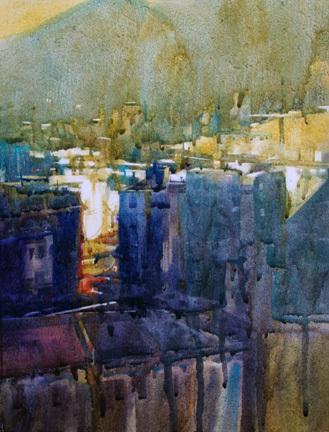 The Baltimore Watercolor Society is pleased and excited to host Mark Mehaffey in a four-day workshop from Tuesday, June 2, 2015 through Friday, June 5, 2015 at the Hawthorn Center in Columbia, MD. Mark will also jury the 2015 Mid-Atlantic Watercolor Exhibition hosted by BWS. Mark’s paintings are included in corporate, private and museum collections. 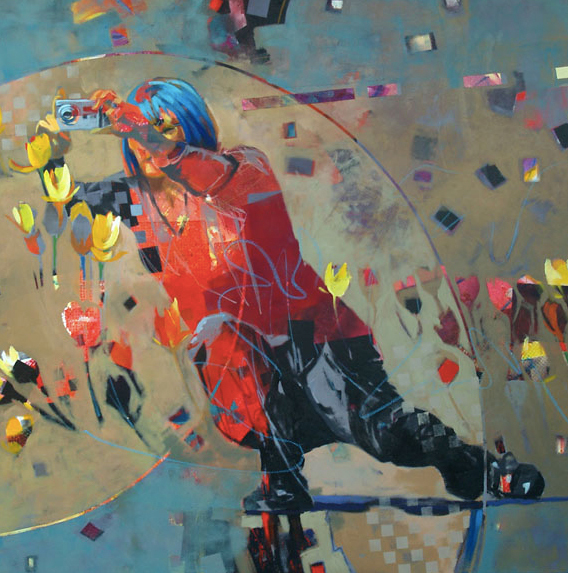 Among his many awards are the Silver Medal of Honor from the American Watercolor Society and the Shanghai Zhujiajiao Watercolor Biennial Award, the top award in the TWSA and the top award in The San Diego International. Mark is the author of “Creative Watercolor Workshop” by North Light and is a popular juror, he was honored to serve as a juror of election for both the American and National Watercolor Societies. This will be a split workshop: the first half will cover working from a photo reference, value plan and color options; the second half of the workshop will cover working experimentally and intuitively using abstract imagery. Participants will create paintings using the elements of shape, line, value and color to simplify subject and use a variety of color plans to create emotion and mood. Discussion of content, the importance of color schemes and line quality will also be discussed. Participants will also work intuitively with shape, color, line and especially texture to produce an abstraction with a personal focus and a representational work based on personal reference choices. There will be both group and individualized instruction with time set aside for critique. This is a fast moving, fun, mixed water media workshop where we all learn nd share. All levels are welcome as long as everyone is comfortable with their materials. Participants should bring their current sketchbook and photographs (5 or 6) of possible subject matter. Include a 4 or 5b pencil to assign value to shapes. One quarter sheet of hot press Arches 140lb paper painted with two coats of Gesso on both sides. - One quarter sheet of cold press Arches 140lb paper painted with two coats of Gesso on both sides. One quarter sheet of hot AND cold press Arches 140lb paper painted with two coats of Gesso on both sides. - One sheet (22x30) of Arches 140lb rough or cold press watercolor paper (Arches recommended). - 6 sheets of medium weight YUPO plastic paper. The 20x26 size is recommended. (Available @ Cheap Joe’s Art Stuff and Daniel Smith). - One 9x12 sheet of graphite transfer paper. – A number 10 or 12 round, a one inch flat and a 2 inch and a 3 or 4 inch flat, a rigger in size 4, 5, or 6, two or three inexpensive bristle brushes for scrubbing out/lifting and any other favorite brushes. - Water-soluble ( I use water-soluble) or wax based colored pencils and or crayons. – Two rolls of paper towel, No. 11 craft knife (number one handle, number eleven blade) and a couple of extra blades. - Bring a bag full of “texturing” materials, stencils and stamps. (Bubble wrap, gravel, open weave material, leaves, anything that can be rubbed through or thrown into wet paint). - One large yard size garbage bag, three or four sponge (not cloth) rollers (2, 3 or 4”) from your local hardware and one roll of masking tape, your palette, and two water containers, plus any other materials and supplies you just can’t do without. - Bring a plastic table cloth, butcher paper or some other suitable cover to put down on either the large round table or large rectangle table as a protection. You will need to clean your own table after the workshop and this will make your job much easier. The price for the workshop is $350 for BWS members (Signature Artists and Associates) and $400 for non-BWS members. Registrations for two other 4-Day BWS workshops to be held in 2015 will also open on February 7. Ted Nuttall - April 27-30 and Laurie Goldstein-Warren - October 19-22). Paid registrants who cancel before May 2 will receive a full refund less a $25 cancellation fee if the spot can be filled from the waiting list. If the spot cannot be filled, the amount refundable is 80% of the workshop price. Paid registrants who cancel after May 2 will receive a full refund less a $50 cancellation fee if the spot can be filled from the waiting list. If the spot cannot be filled, no refund will be given.